Downunder Mining is capable of servicing and modifying all makes and models of axial fans commonly found on the Australian market. Our team is dedicated to providing you with high quality service and workmanship. Our fan servicing is guaranteed to meet or exceed all of your expectations. Fans are cleaned, stripped and thoroughly assessed. Worn or damaged parts are noted. Quotes and servicing reports are prepared. When the quote is accepted repairs can begin. Serviced fans are tested before being dispatched back to the customer. 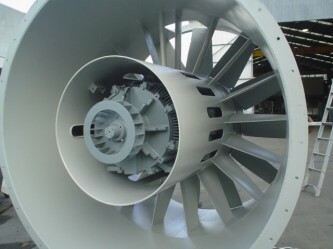 Downunder Mining also specialises in fan modification. We can assess your current fan and determine whether we can modify the existing design for a new duty. This results in optimised fan performance and lower capital expenditure for our client.